On Universal Children's Day - look what the PA teaches its children! - look at what the PA teaches its children! 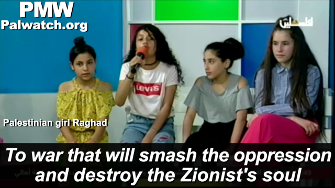 On the occasion of Universal Children's Day - here's a taste of what the Palestinian Authority teaches Palestinian children. - Jews are "the most evil among creations," and Israel is "the enemy," Jews are "Allah's enemy" and "Zion is Satan with a tail"
Today, November 20th, is known as Universal Children's Day because it is the day the UN General Assembly adopted the Declaration of the Rights of the Child (1959) and the Convention of the Rights of the Child (1989). The PA joined the UN's Convention of the Rights of the Child in 2014. Coinciding with Universal Children's Day, PMW Director Itamar Marcus will be addressing Canadian MPs today, showing them that the PA is bringing up Palestinian children in a toxic environment in which they are constantly exposed to messages cultivating hate and encouraging terror. Having reviewed PA school books and broadcasts on official PA TV, then Senator Hillary Clinton stated in 2007 that the PA "profoundly poisons the minds of these children." 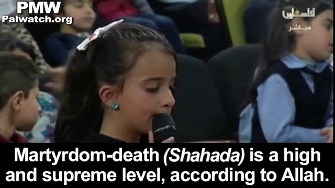 The PA and Fatah leadership is abusing Palestinian children by presenting terrorists as heroes, "Martyrs" as role models, and glorifying the murder of Jews and Israelis. Sports tournaments, names of schools, school books, cultural events, and even music videos glorify terrorist murderers and urge Palestinian youth to aspire to kill and be killed. Jews are presented as lowly, wicked creatures, and Israel is "the enemy," and "Satan with a tail." Israel has no right to exist in any borders, and the PA teaches kids to see all of Israel in addition to the PA areas as "Palestine" - A "Palestine" they will "liberate" and "return to," and which will "return" to them in its entirety. 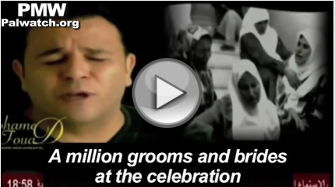 Jews are "the most evil among creations," and Israel is "the enemy" and "Satan's project"
And Jerusalem, you who are filth, is clean and pure..."
PA TV host: "Bravo! 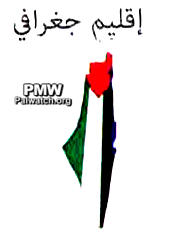 Jerusalem is the eternal capital of Palestine, we will never forget it." Even younger girls have recited this poem too. Echoing this, a preacher taught in a sermon televised on PA TV that Hitler was sent by Allah to punish the Jews for their evil behavior. 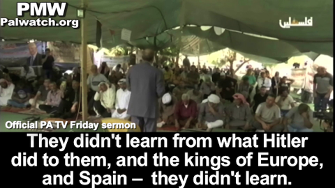 "They didn't learn from what Hitler did to them, and the kings of Europe, and Spain - they didn't learn. 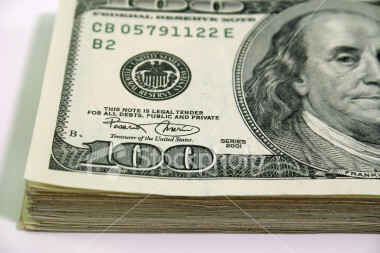 They have continued to behave the same way: The mentality of arrogance toward other people. The mentality of superiority over other people. The mentality of seclusion, the mentality of settlement. This mentality, an ideology of planning and systematically working to incite wars and strife in the entire world. 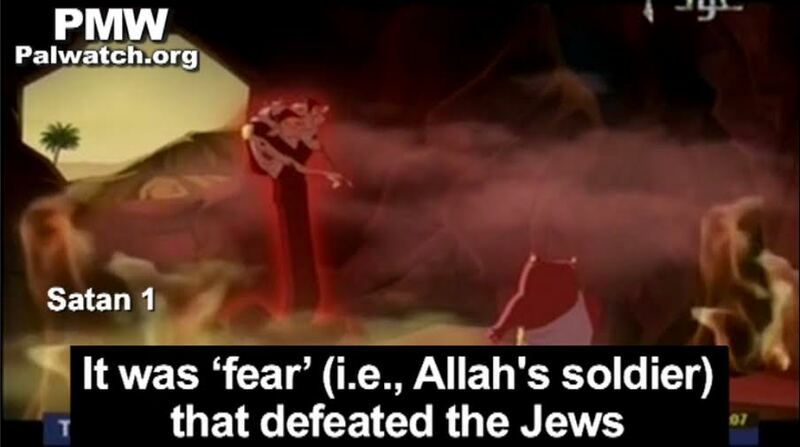 Those [Jews] have not learned from the events of history." The PA has named 32 schools after terrorist murderers. One of them is Dalal Mughrabi who led a group of terrorists who hijacked a bus with Israeli civilians in 1978 and murdered 37 of them, including 12 children. The PA has not only named 6 schools after her, but specifically teaches fifth-graders to aspire to be like her in an official PA schoolbook currently in use. The book features murderer Mughrabi on a list of "heroes" - "the best of the best" - and teaches that "every one of us wishes to be like them." Another terrorist role model is 13-year-old Ahmad Manasrah who stabbed and almost killed a 13-year-old Israeli boy. Manasrah had a school football tournament named after him, in which many PA schools participated. Such a tournament gives Palestinian children of the same age as the terrorist a clear idea of who their role model should be and who they should imitate. The PA also uses a terrorist murderer to promote reading to young Palestinians. "Martyr" Baha Alyan who was killed while murdering three Israeli civilians on a bus has had reading events named after him at Palestinian universities, and has been honored at a library event and at a scouts course. 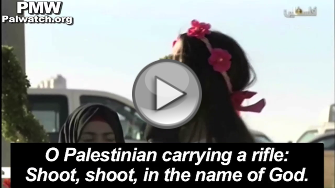 Girl: "O Palestinian carrying a rifle: Shoot, shoot, in the name of God. Shoot, shoot, in the name of God. The path of the Martyrs is above all. They have sacrificed the most precious of all so that we will see the oppressor retreating..."
PA TV host: "Bravo, thank you very much." "A Martyr (Shahid) is a person who has sacrificed his life in order to elevate the Word of Allah. A person becomes a Martyr when he defends his homeland or honor, or fights those who don't believe in Allah Almighty. Martyrdom-death (Shahada) is a high and supreme level, according to Allah." "The families of the Martyrs (Shahids) and their relatives find themselves proud of the Martyrdom (Shahada, a play on words, also means "certificate") that their children achieved with the Creator and in the homeland... Sixteen [students] succeeded [in achieving] the Martyrdom (Shahada) of the homeland and withstanding its difficult tests, for death as a Martyr is the path to excellence and greatness, and the path of those who know how to reach the great victory..."
Likewise official PA TV teaches children that they will "return to all of Palestine." As PMW reported yesterday, a recent episode of the PA TV children's program The Best Home included several examples of this message. 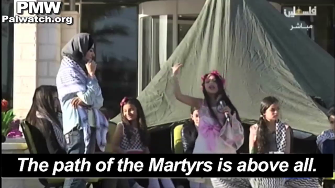 One girl recited a poem about "liberation" which urged "to war that will... destroy the Zionist's soul." Being fed a steady diet of the messages shown above, Palestinian children hardly have a choice. They can hardly be expected to choose the path of peace when all they have been taught is to hate, kill, and be killed. It is no wonder that in recent years a large number of Palestinian terrorists have been teens. Palestinian children are victims of the PA leadership's indoctrination, and unless Palestinian leaders stop poisoning the minds of their children, peace will never be within reach.